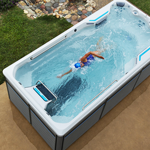 Texas Hot Tub Company believes in healthy and active lifestyles through swimming and aquatic therapy. We believe Swim Spas and Hot Tubs are a serious purchase, and we are celebrated for our commitment to great customer service. Our sales team loves helping our customers find the best Swim Spa or Hot Tub to fit their needs when the time is right. Our award winning 4500 square foot showroom offers you a relaxed shopping atmosphere with all the newest models for easy comparison. Enjoy a test soak or swim, and get the latest grilling recipes from Grill Dome and MeatChurch. Come visit, you’ll appreciate the Texas Hot Tub Company experience. There are many hot tubs and spas in the market today. However, the closer you look, the easier it is to narrow your choice. 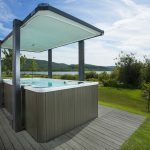 If you want to transform tension into rejuvenation every time you step into your hot tub, look no further than Jacuzzi® Hot Tubs. Our goal has always been to offer the best hot tubs – the most comfortable, energy-efficient and high-performance spas on the market – so you can enjoy the full range of wellness benefits that a spa can offer. Call today for a private appointment to enjoy a trial workout in an Endless Pools Swim Spa, or to experience how a Jacuzzi® hot tub can add a new dimension of relaxation and family togetherness to your home. Texas Hot Tub Company is Texas’ newest and most complete resource for Jacuzzi Hot Tubs®, Endless Pools Swim Systems® and Freeflow Spas®. 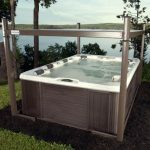 Texas Hot Tub Company may be the newest name in Texas’ hot tub industry, but as part of the Coleman Bright Ideas For your Home™ family, experience and reputation are unrivaled in the marketplace. Representing the entire Watkins Wellness collection is an honor only a handful of dealers around the world can claim. Have a service request? 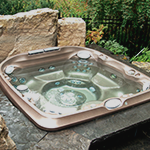 Our spa technicians are experts in the field and offer top quality service on Jacuzzi Hot Tubs®, Endless Pools Swim Systems® and Freeflow Spas®. Love My Spa! Super comfortable and relaxing spa. I have RA and it help to sooth my joints. Well Worth the Money! 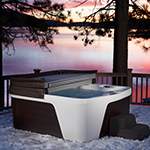 We purchased our Caldera Hot Tub around the first of the year. My doctor approved it for knee surgery that I had, and actually wrote a letter approving it for my knee. We were able to alleviate the taxes on it. We have used it for 7 months now and absolutely love it! Very easy to use! We cleaned it for the first time a week ago, and it could not have been easier! The draining, cleaning, refilling did take most of the day, but it turned out to be so easy! We definitely recommend the Caldera Spas. We love our Caldera spa! We enjoy the heat and jets after a long day. It is very relaxing and soothes the aching muscles. When the grandkids come to the ranch, we lower the temperature to 84 and they think the spa is a pool! They enjoy playing in the water when the outside temperature is just under the century mark here in Texas. We love our Caldera Spa! It has been the best investment and we sleep better and are more relaxed because of it! If you are looking for a hot tub you should wet test it first. They have a great place to wet test. Once purchased most likely you will need help with delivery and set up. They have great field people who deliver and set up.